It wouldn’t be much* of an exaggeration to say that today’s Makuuchi matches consisted entirely of highlights. Daiamami – Myogiryu. In the initial clash, Daiamami secures a good, strong, overhand left grip, and although the uwatenage attempt doesn’t send Myogiryu over, it does turn him around so Daiamami can easily show him out. Ishiura – Nishikigi. Ishiura’s tachiai is quite low – not a proper submarine, but enough to get his head planted into Nishikigi’s chest. But Nishikigi gets an arm hooked under Ishiura’s chin to lever him upright, and soon has the smaller rikishi on the bales. Ishiura realizes he can’t win the test of strength, grabs the left arm with both hands and pulls hard (from the position, I’d almost say he was trying for something like an Ipponzeoi shoulder throw). But he can’t manage it – Daiamami’s footing is just too good, and Ishiura tumbles out of the ring. Abi – Ryuden. This could be the bout of the day! Abi’s go-big-or-go-home tsuppari versus Ryuden’s beltwork. Abi has to give a lot of ground to keep Ryuden off the belt, trying for slap-downs which get Ryuden stumbling but not down. Just as it looks like he’s in real trouble at the bales, he manages to hook the back of Ryuden’s neck and pull him down and forward while sidestepping. That’s enough to get a good overarm mawashi grip and roll him down with an uwatenage. Asanoyama – Yutakayama. Asanoyama might be Mr Happy, but he’s taking his sumo seriously, battling through some face-rearranging pushes to get a very deep left underarm grip. Yutakayama fights back with a credible attempt at gaburi-yori, but it leaves him off-balance, allowing Asanoyama to swing him around and out. Tomorrow, Asanoyama’s opponent is J1w Kyokutaisei, against whom he has two wins and no losses, so I would not be at all surprised to see him undefeated a third of the way in and competing for the yusho from Maegashira 16. Again. Takekaze – Daiesho. Daiesho looks eager to start! He opens with a powerful oshi attack, but once he’s chest-to-chest with Takekaze, he doesn’t relent for a moment. This bout is all Daiesho, and he looks great. Sokokurai – Kagayaki. A short one. Right after the tachi-ai, Sokokurai finds himself unbalanced by a double-handed shove, and the match is over a split second later. Sokokurai may be a victim of over-promotion; the competition in Makuuchi is much stronger than the guys that he minced for the Juryo yusho recently. Kotoyuki – Daishomaru. From the tachiai, you might be expecting a repeat of Daiesho’s bout. Daishomaru has his hands down well in advance, and launches straight into a thrusting attack – but apparently Kotoyuki had been watching that one too. He turns to the left, putting a hand just below Daishomaru’s left shoulder to help him along, and Daishomaru’s enthusiastic tsuppari just results in him staggering past his opponent. Kotoyuki gives him a finishing shove a moment later. Shohozan – Aminishiki. I really thought Uncle Sumo had this one for a moment! His slap-down doesn’t work, but he goes straight into a throw attempt, assisting his kotenage by lifting Shohozan’s leg with his foot. Unfortunately for the old man of sumo, Shohozan’s balance is just a bit too good. He gets his leg back down and it’s Aminishiki who goes over. Excellent throw counter from Shohozan. Chiyomaru – Kaisei. Slow-motion replay not required as two rikishi who really need to lose some weight shove each other glacially around the dohyo. Chiyomaru’s “hikiotoshi” win is really more of a sidestep, Kaisei toppling like a column with very little help. Chiyoshoma – Tochiozan. Chiyoshoma seems to be going for the rarely-seen kubinage (headlock throw), but he just can’t do anything about Tochiozan’s incredibly deep inside right grip, and is powered out. Their fifth honbasho meeting, and Tochiozan has now won all five. Chiyonokuni – Ikioi. Ikioi finally picks up a win, surviving first a kotenage and then an uwatenage attempt on the way to forcing Chiyonokuni out. Okinoumi – Takarafuji. Takarafuji’s seventh straight win against Okinoumi. He quickly gets a good, deep Hidari-yotsu (left hand under, right hand over) grip, and Okinoumi can’t break it, can’t establish a good grip of his own, and can’t keep himself low enough to resist being shoved out. Endo – Arawashi. Endo does a fantastic job of preventing Arawashi from getting a good mawashi grip while forcing him back. Arawashi’s foot slides wildly on the clay, and his desperation hatakikomi attempt doesn’t work. It seems he realizes he’s done, and steps out. Chiyotairyu – Shodai. This was the big let-down of the day. Chiyotairyu’s knee buckles less than a second into the bout, without Shodai doing a thing, and he hits the clay. Tsukihiza; take a drink. Mitakeumi – Takakeisho. Mitakeumi grabs a handful of mawashi on the tachi-ai but can’t keep it, and a strong back-and-forth oshi-zumo battle breaks out. It ends with a perfectly-timed backstep from Mitakeumi, sending Takakeisho pitching forwards to the clay. Onosho – Tamawashi. Onosho seems to cotton on to what he’s doing wrong, and despite several slap-down attempts from Tamawashi, doesn’t lose his footing. After some vigorous oshi-zumo, it’s Onosho who gets the hatakikomi win! Goeido – Hokutofuji. The first half of this bout was cringe-worthy as Goeido retreated, looking for hatakikomi and hikiotoshi opportunities, letting Hokutofuji control the pace of the bout and looking like he was heading for an inglorious defeat. Thankfully for him and for all of us who enjoy his sumo, he apparently managed to reboot in the middle of the bout and started moving forward again. He secured an ottsuke to keep Hokutofuji’s right arm off the mawashi, drove him back, and pitched him out. Tochinoshin – Takayasu. Two of the biggest, strongest rikishi collide with earthquake-like force. Takayasu had to retreat to keep Tochinoshin off the mawashi – including a nail-biting toes-on-the-tawara moment – but the big Georgian resisted the slap-down attempts and eventually caught up to him and got a strong belt grip. Takayasu, of course, is big and strong enough that he can fight Tochinoshin in a yotsu battle (although apparently he’d rather not). Tochinoshin pulls, Takayasu pushes, and the Ozeki runs out of balance a split-second before his opponent runs out of dohyo. A very, very close fourth win for Tochinoshin, and a very impressive bout from both of them. Kakuryu – Ichinojo. Kakuryu looks awesome so far. And, full credit to Ichinojo, he battled on the tawara for a lot longer than he usually does! He even got the Yokozuna back to the bales early in the match, but he couldn’t finish it, and Kakuryu was able to force him out. No reactive sumo or tricks here, just straightforward yorikiri against the biggest man in the division. Kotoshogiku – Kisenosato. Oh dear. Kotoshogiku locks up quickly with little resistance from Kisenosato and gets the gaburi-yori rolling. The Yokozuna isn’t so easy to move, though, and even away from the tawara, Kotoshogiku is bouncing away to little visible effect. He changes tactics and goes for a throw – and, amazingly, it works. Kisenosato hits the clay. While I’m happy to see Kotoshogiku earn a win (and a kinboshi), I’m rather worried that this may be Kisenosato’s last basho. Hakuho – Yoshikaze. Are we sure this is Hakuho? He can’t muster sufficient force to drive Yoshikaze back, and when he goes for the retreating slap-down, it’s Yoshikaze who slaps him down. I’m not sure I’ve ever seen a loss like that from the dai-yokozuna. Great day of sumo–the right highlight reel to show a new fan. Mitakeumi looked awesome against Takakeisho. Onosho needs to study that man’s footwork–THAT’S how you move forward without losing your balance. Even in his win, Onosho still looks loose and wobbly on his advances. Chiyonokuni needs to get back to Monkey King Sumo–the last few days he’s just locking up against bigger guys who toss him around. Today he tried getting back to his sumo, it just didn’t work out. I thought Hokutofuji wrestled really, really well. Goeido just brought the best and didn’t fall into the defeat-by-retreat trap he always sets for himself. Abi? Tochinoshin? Shohozan? All terrific battles. What a fun day. It’s no longer a rumor. He now has two injured toes – he got his left one fractured in this bout and hurt the right one as well. Miyagino oyakata says it has swollen up and they will wait until morning Japan time to see how the toes are doing. Expect a kyujo announcement. I looked earlier in the sumo DB. In the previous two occasions in which he lost two bouts in the first four days, he went kyujo. The previous occasion on which he did not go kyujo, he was still an Ozeki, back in 2007. If he fractured a toe in this bout, I’m not going to begrudge him the kyujo. Get well soon, boss. Absolutely, Pinkmawashi. 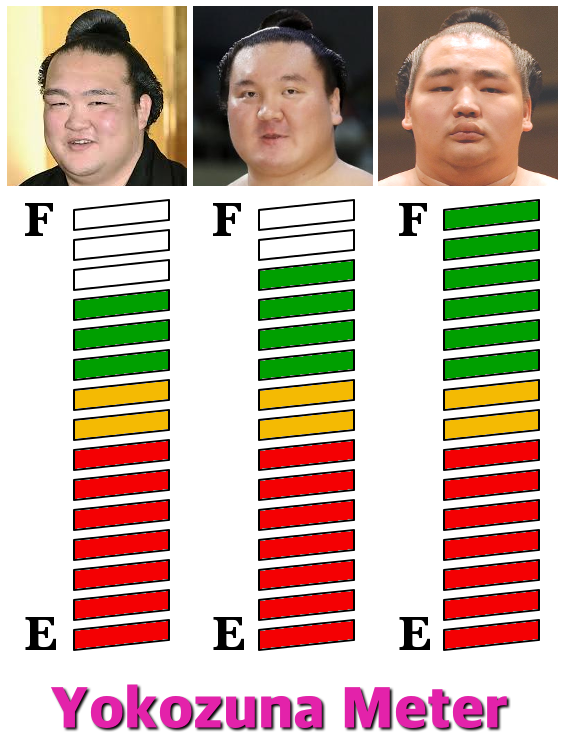 Yesterday I remarked that Hakuho’s bout was embarrassing to watch. Now we know what’s wrong with The Boss. I hope Hakuho has sense enough to go kyujo. After all, he’s not getting paid in January, so why screw up his feet forever? Echoing your well wishes for the Dai Yokozuna! His only problem is that it will draw further criticism. Some people in the media have already suggested that he intends to get to 2020 as active Yokozuna by sailing from kyujo to kyujo. People will say that he just invents kyujo to avoid the embarrassment of not being able to do proper Yokozuna sumo. As long as it’s just talk show hosts and the Twitter back alley bashing, fine. But if the complaints get to the YDC, he may be in serious trouble. Of course, if his toes are really broken, he cannot do sumo, period, and he will just be repeating Kisenosato’s mistake by trying. If I were him, I’d include the X-rays in the press release. Kisenosato just looks like he has absolutely no idea what tactic to employ to win, which is very unlikely his old self. Hakuho really struggling to work out how to approach the tachiai and it’s letting him down big time. That’s true .He is a shadow of his old self .Kotoshogiku was in control from the beginning.Hakuho probably has recurring injuries issues, mentioned above. Even if he wins against Yoshikaze tomorrow AND Hakuho pulls out, Kisenosato will still have to face Kakuryu, Goeido, Tamawashi, Mitakeumi, Onosho, Tochinoshin, Arawashi + 3 others in the last ten days. On his current form I can’t see him picking up more than five wins from that schedule. As Morrissey sang “I know it’s over,still I cling”. Strangely enough, although this was supposed to have been his “do or die” basho, the YDC is apparently cutting him more slack. They would have preferred it if he was kyujo from day 1, but apparently still don’t want their Japanese yokozuna to become Araiso oyakata just yet. So we may be in for two kyujo in a couple of hours. Or maybe he’ll try for another day or so. I seem to recall something about two oddly contradictory statements from the YDC last month which suddenly made sense when we came to understand that the stern one applied to Kakuryu and the forgiving one applied to Kisenosato. A year ago, the concept of Kotoshogiku picking up a gold star off Kisenosato would have just been weird. Today, it was almost expected…even with Giku’s gas tank running on ethanol fumes. Mitakeumi has entered Ozeki-chase mode, and I would be surprised if he’s not the third ozeki by the end of the year. Hokutofuji, in spite of his record, has really fought well also, and if he stays healthy he has a chance to be an Ozeki in the not too distant future. The banzuke right now is so good. All the joi bouts are intriguing in this tournament. And as the younger talent, like Asanoyama and Abi start climbing, they’re gonna push out some of our old favorites who can no longer consistently hang with them. This basho might be the end of Aminishiki and Takekaze. They will be missed, but the future is pretty exciting. Rooting for Goeido every day but Day 5* — he really does bring the excitement (including, yes, the excitement about whether he’s going to bring the excitement on any given day). * Only rikishi I ever rooted for against Tochinoshin was poor Ura, and sure he won that bout, but… *sigh* You can’t catch ACL damage by casual contact, right? Right?!? Watched some Ura stuff on YouTube- he’s a genius and hope he comes back soon. a fully healed Ura is a joy to behold! i miss his sunny disposition and cherry blossom pink mawashi dancing across the dohyo! and boy oh boy – when he wins, he wins spectacularly! recover well Ura-sama! Onosho’s ballerina spin move at the end of his match wuz impressive and lol. Tak and tochinoshin shudv been a rematch. Love seeing hak lose! I’ve seen the sentiment that Takayasu vs Tochinoshin should have been a torinaoshi, but it doesn’t make any sense to me. The gyoji had a clear view of Tochinoshin’s heel and, in particular, of the sand that a touch-down would have disturbed. If the heel had left a mark Tochinoshin would have lost; it didn’t, so he won. It’s as simple as that. If Tochinoshin’s heel was out, he would have just plain lost. It wasn’t. What’s not so clear is that he should have won the match the way it ended, especially not without a mono-ii. So I become a big chiyonofuji fan, enthusing about his exciting matches and all-in style, and what happens? None of his first four bouts are shown on the nhk highlights! Just shows what an interesting tourney it’s been so far. Head over to Kintamayama’s YouTube channel! He posts every Makucchi bout from every day of each basho! So who’s the favourite for the yusho now? On current form got to be kakuryu and goeido. Both looking very hard to beat. But if either drop a few someone much further down the banzuke might have a chance? I’ll wait until the second week before clambering back on the Asanoyama wagon, but if tochinoshin can keep his knee in decent shape maybe he’s in with a chance.